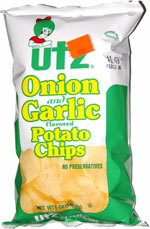 Taste test: These were very good onion and garlic chips. The best thing was that the bag was full nearly to the top, and almost none of the chips were broken. This is how all bags of chips should be! 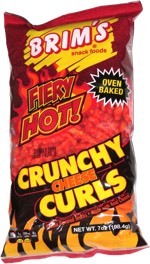 The chips were roundish and crisp with a sweet garlicy onion flavor, more garlicy than oniony. Very tasty. Smell test: Mild, nice onion smell. Just slightly garlicy.